And you thought only us normal working folk faced health & safety hazards on the job! 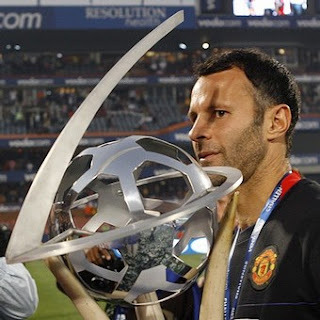 Check out Manchester United's mid-field maestro, Ryan Giggs -- hoisting the pointy and surprisingly dangerous Vodacom Challenge trophy in South Africa this past weekend. Jeez - this apparent torture device is an accident just waiting to happen! It's wonderful to win a pre-season tourney, but is it really worth it when you can come this close to losing an eye, or impaling a vital organ?? Yikes! Come home, Ryan. At least the trophies in Europe have rounded edges and don't masquerade as weapons. I love this post, LTG. The fact that you have put it in your WTF file perfectly coincides with the look on Ry's face. He's all, "Seriously, what the f@ck is this thing? HOW do you expect me to carry this on the plane as hand luggage? Bloody hell, I'll have to buy it two extra seats!!!" Gaz and Rio are probably sh*tting themselves laughing, relieved that neither of them was skipper of the match and therefore keeper of the scary pointy doohickey. Give it to C-Ron...ha ha ha! Not that we wish him *any* harm...no, not us....much!